Victoria joined Whiting & Partners as Marketing Manager in March 2017 having worked in and around her homeland in Suffolk for the last 2 years. 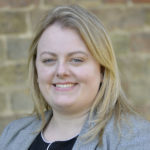 After graduating from the University of Essex in 2012, Victoria went on to work in recruitment before moving into marketing and completing the Chartered Institute of Marketing Professional Diploma whilst working in London. Responsible for the organisation and coordination of the firm's marketing activities, Victoria is often out and about visiting our offices or networking at various events across the region. In her spare time Victoria enjoys baking and loves to travel, especially if it involves trying some local cuisine!